The Chicago Food Swap had its May event this past Sunday, May 18, at Green Home Experts, a “green” lifestyle boutique in Oak Park. This was the third time that owner Maria Moran opened her store’s doors to the Chicago Food Swap and, just as before, it was a perfect location for a swap. On a sunny spring afternoon, Maria’s garden center was a huge draw and all the swappers took advantage of the generous swapper discount to stock up on Ball jars, sustainable cooking utensils and gardening supplies. The swap was small and intimate, which suited the somewhat tight quarters at Green Home Experts, but everyone agreed that the smaller size allowed the group to talk more and get to know one another better. One of the other fun things about May’s swap was the number of amazing raffle prizes and giveaways for the swappers. Each of the first fifteen swappers who arrived received a strawberry huller courtesy of OXO. With most of the Chicago-area farmers markets opening next weekend and strawberries being in season, I suspect that those hullers will be getting a workout. Ulysses Press also sent us a set of vegan cookbooks as a raffle prize. Teen swapper and baker extraordinaire Emmie won those. For the first time in its two-plus year history, the Chicago Food Swap had a theme for the swap and that theme was, in fact, vegan. I was inspired by some of our passionate vegan swappers who proved to the rest of us that vegan foods of all kinds, even baked goods, could taste delicious. A few months ago, veteran swapper, and vegan, Ian had expressed to me his concern that there are not always a lot of vegan items for him to choose from when he comes to the swap and asked if I would mind if he started a vegan swap. I replied that I would not mind at all, but that one of the things that I liked best about the Chicago Food Swap is that it breaks down some of those silos we tend to put ourselves into. I was reluctant to lose that community-building aspect of the Swap, so I proposed to Ian that we try a vegan-themed swap and see how it went. For the May swap, then, we encouraged, but not required, swappers to bring vegan items. From the diverse array of offerings at our first vegan-themed swap, I would say it was a success. There were definitely some non-vegan items, like Tara’s duck eggs, which were as popular as always. But because many of the swappers in attendance are not actually vegans, those items found enthusiastic homes. And many swappers — both vegan and non-vegans — brought vegan items, which made for an interesting and out-of-the-ordinary mix. I definitely saw fewer sweets and baked goods than usual, which perhaps is a good thing. Many swappers, myself included, often find themselves coming home with way more desserts than intended. So it was good that the vegan swap forced us to make and trade for healthier items. So, not all the vegan items were healthy! Some swappers really embraced the vegan theme and made their own vegan staples, like tofu and seitan. Mom-and-daughter team Laura and Emmie also made a smoky, vegan bacon substitute out of mushrooms. I thought it tasted great and was excited to get some. I brought hummus and white bean dip, both made with ramps, as good vegan sources of protein. Diana who writes for Chicago Foodie Girl brought vegan chili and I also saw some quinoa salad. There were also a lot of jams and pickles, foods that are naturally vegan. Swapper Jill brought a cool array of dehydrated fruits and vegetables. First-time swapper Dantee brought two kinds of chia pudding – those chia seeds are everywhere these days! There were also all kinds of great pantry items like saffron salt from Ian and Alison and several kinds of mustard. New swappers Cathy and her husband Kevin brought cucumber and rhubarb sangria which, no surprise there, proved to be very popular. But did I mention the baked goods? There were plenty of sweet treats of both the vegan and non-vegan variety. I indulged in some of Sandy’s carrot cake and it was worth every calorie. The blueberry crumb cake from Leah was also popular. I was impressed with first-time swapper Lydia’s vegan snickerdoodles and other folks had brought different kinds of vegan cookies, quick breads and even vegan fudge. So creative! Swappers Gary and Keli brought some different kinds of focaccia that were very popular as well. And then, as the swap was winding down, reporter Monica Eng from WBEZ, the Chicago NPR station, arrived to interview some of the swappers. I met Monica, who is the co-host of a greatfood podcast called Chewing the Fat, at the IACP conference back in March — and by “met,” I mean “accosted in a hallway.” When I told her that I was the founder of the Chicago Food Swap, she said that the Swap was on her story list, so I encouraged her to come to an upcoming swap. It was a huge thrill for me that Monica came and got to hear from the swappers about why they love the swap so much. Monica also enjoyed browsing at Green Home Experts and even picked up a few things for her garden! 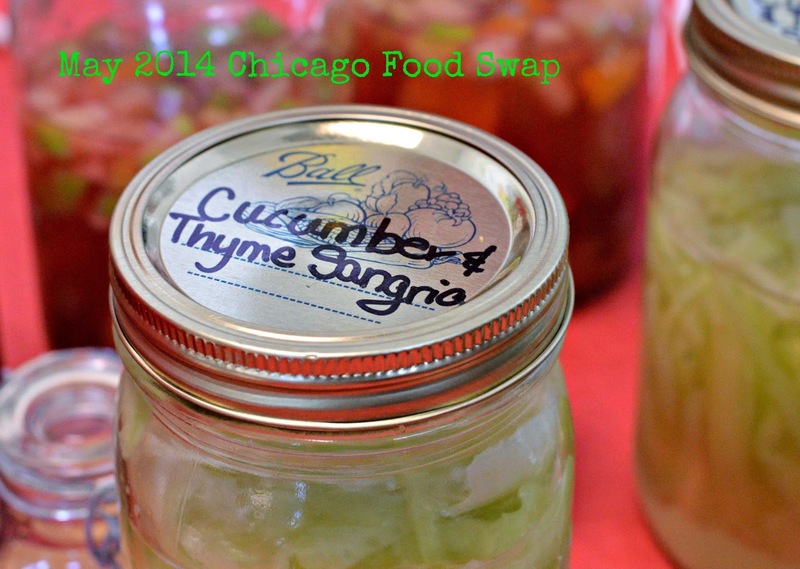 The next Chicago Food Swap is tentatively scheduled for June 29. More details to once everything is finalized. In July, the Chicago Food Swap will return to Free Range Office, a funky co-working space in the heart of Wicker Park and site of the successful March swap. I am taking August OFF, so if you want to swap, save the dates for June and July. Have you come to the Chicago Food Swap yet? If not, why not?